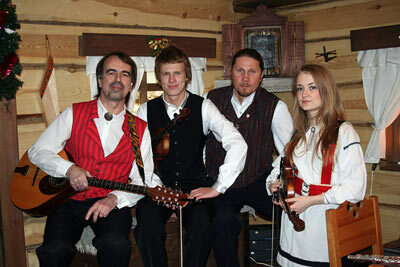 Sattuma is one of the most famous folk bands of the Russian Karelia. Their music blends tradition and modern times. The word SATTUMA translated from Finnish means "hitting the mark" as well as "chance, happenstance". Sattuma is a family band based on the idea "from the fathers – to the children" and "from the children – to the fathers". Fathers and juniors play in perfect harmony. The band formed in 2003 in Petrozavodsk, Russian Karelia, tours and travels a lot. The music of the band is well received and stirs a lot of positive emotions in different corners of Russia, USA, Finland, Scandinavia, Estonia, and Germany. The band plays in concert halls, clubs and festivals. Sattuma plays neo-folk – both traditional songs and melodies and their own material in folk style with original arrangements. The language of the songs presents dialects of Finnish, Karelian and Russian. The instrumental arsenal of the band is rather rich and includes strings: violins, bouzouki, kantele, jouhikko, bass; and wind instruments: clarinet, bagpipe, shepherd's flutes, chipsans, mankeri, didgeridoo, as well as accordion, harmonica and jew's harp. Since there are fewer musicians than instruments, the variety of sound is guaranteed! There is enough mood and drive too! as well as in the Russian analogue of FaceBook "vkontakte"